First up, thank you to everyone for your encouragement following my last post. I got so many lovely emails, comments and messages. I really appreciate it and for those of you who have asked, I will definitely keep updating you on the challenge here on the blog as well as on social media. I realise now that there are quite a lot of readers who don't use social media and would rather follow the blog here on the website. I'm delighted to hear that lots of you are going to do the challenge with me and that's so encouraging too. I hope it helps you to streamline your wardrobe in some small way - and makes getting dressed a bit easier. I think it will also help you work out what key pieces are missing from your wardrobe. I'm already making a list for February. But I just wanted to quickly share what I got in the sales as promised. 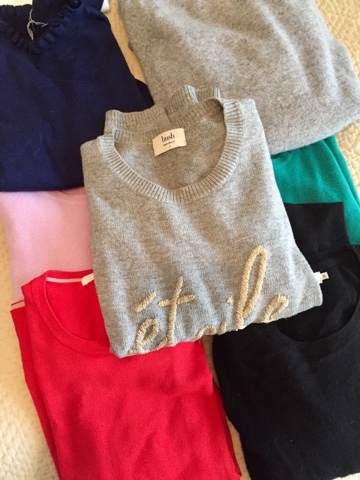 First up, some knitwear and I bought two merino crew necks in the Benetton sale. Some colours were reduced to £25 and others to £15. I picked up two that had been reduced to £15....one green and one pink - you can see them in the photo below and I'm wearing the pink one in the next photo. Bright for me I know but I wear black and navy bottoms to work all the time and wanted to brighten myself up a bit! I also picked up the blue ruffle neck (and sleeve) jumper in the picture above. From Oasis, it's got quite a neat fit...perfect for wearing with wide leg trousers. I'll wear it this week to show it better...it's unfortunately not available online. 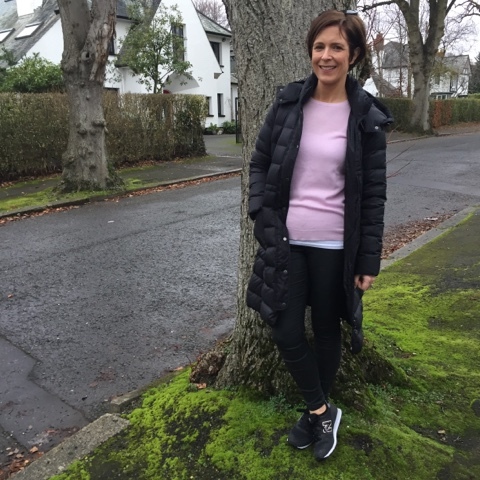 While in Benetton I got a white shirt, a white jersey top and my biggest splurge (thanks to my mother in law's Christmas gift), a Benetton black down puffa coat - all feature in yesterday's post with links. 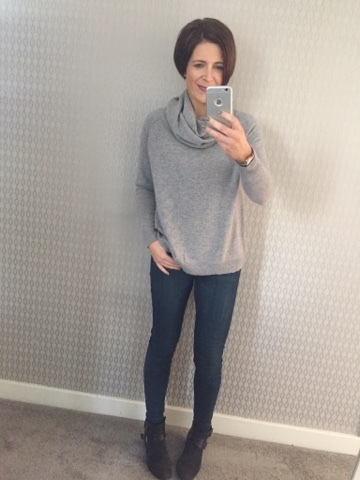 Online now and I ordered a couple of jumpers from Boden - the Tilly one in red, which you'll have seen on my last post, and the Katrina jumper in mink, which went back. It's gorgeous, soft and has a lovely button detail on the shoulders but the colour didn't do much for me. My godson sent me a Warehouse gift card (YES!) 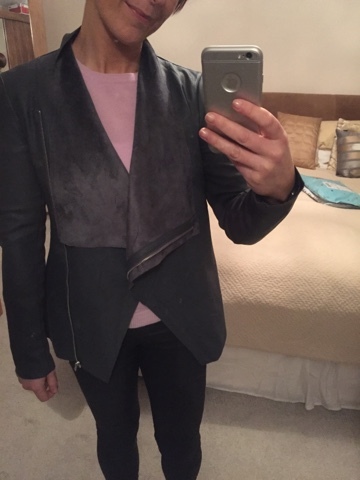 and so I managed to pick up the grey faux leather waterfall jacket that I tried on during my Victoria Square styling session last month. 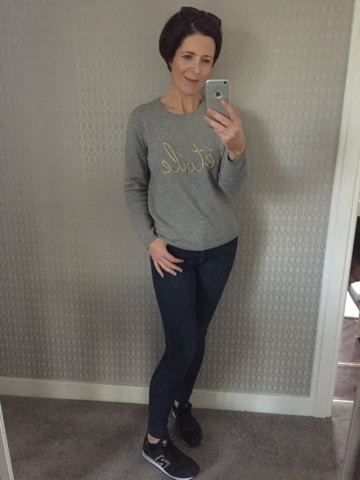 I loved it at the time but couldn't justify it....but it's down to £30 now and I can't wait to wear it when the weather warms up a bit. 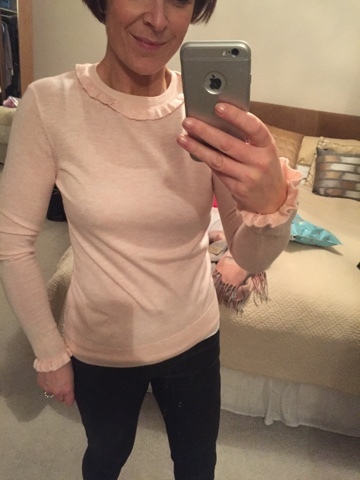 As I was paying delivery anyway, I added this blush jumper on a whim but I've sent it back. Full marks to Warehouse for not charging postage both ways...unlike others - Boden, I'm looking at you!. 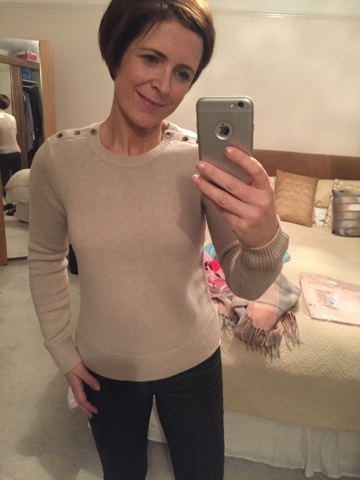 I returned it as it was too tight on the neckline - I could hardly get it over my head. The arms were super tight too - and it was a size 12! Not online so I can't link to it but I'm not recommending it anyway. and my Topshop coated Joni's. I've been watching out for my size to be in stock every time I go into Topshop as my existing pair are falling apart and are too big for me - though I have worn them constantly despite that. They're just a great jean. They weren't in the sale but I didn't mind...I'd buy them full price every time. 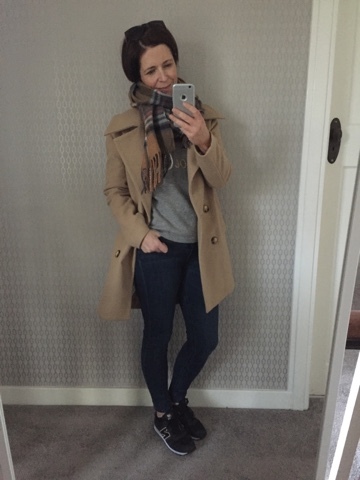 And my final purchase which hasn't arrived yet is a fresh pair of Dune London Pondos. Regular readers will know how much I adore and wear these black ankle boots from Dune that my husband got me last Christmas. Well, I've been keeping an eye out for a new pair as I have worn these ones to death all year. There's still plenty of life in them yet so I'll keep this new pair in storage for now. I got them brand new from eBay for just £43. Result - as they're still on sale on the Dune London site for £104. If you have something you love - don't hesitate to repurchase. I'm already kicking myself for not getting another pair of Seven Boot Lane Eloise boots in the sale - my size is all sold out now. Oh and before I go, I've just read an email from my contact in Seven Boot Lane and they've given me a code for 20% off their winter sale prices. Simply use EXTRA20 at check out. Wow...I'm off for another look at the entire sale range right now..
Hope you've had a good day - I know lots of you were back to work and more again had kids back to school. My 3 are all back tomorrow....and I'm back to work too. Looking forward to the routine returning and to wearing something a little smarter from my slimmed down wardrobe.